There are way more hand techniques in Kata than kicks, and when there is a kick ussually there is only one. There are two consecutive kicks in Kusanku Dai and Chinto, one would say that the first is a faint , as we see in competitional sport Karate, but I doubt that the traditional Karate would consider that. What is your take on it? Two quick kicks to the shins is my personal take on them. It drives the leg back and brings the head forward, which both kata then exploit. Here a video of the Chinto / Gankaku one. I’d be interested as to what others think too? In this video we quickly show a flow drill for the first part of Chinto / Gankaku kata. It was filmed at an event in the UK in February, 2016. What is shown in this clip is not the instruction that the group received (over some hours) but is a very quick summary of what had been covered. This is therefore not an instructional video. This drill should also not be thought of as THE way to drill the bunkai; instead it is one of many ways that fit into a wider training matrix. This particular type of drill is good for time efficient practice and as a complementary drill to be done alongside practise of the solo-form. On it’s own it is not enough because the methods should also be done singularly, in alternate order, should be varied in line with underlying principles, and included in unscripted live drills (kata based sparring). I nevertheless hope the footage of this drill is of some interest. IMPORTANT: All martial arts techniques are potentially dangerous and must only be practiced under the supervision of a suitably qualified and experienced person. Well Lyoto Machida did kick Randy Cotour out with a double kick, the first one was a feint while the second one kicked his teeth out. From a sport fighting perspective, the feint switch kick works fine, when set up correctly, but in the context of the kata that doesn't make much sense, given the range kata is intended for. I've used a similar approach to Iain's, although I tend to look at it as the kicks being Option A and Option B, telling you to kick whichever leg the opponent has in front to drive it back, so instead of using both kicks I would only use the one on the appropriate side for the situation. If I do use both kicks, I generally vary the targets a bit--shin and knee, or knee and inner thigh, etc. "This kick is from Karate, it's the Kanku Dai. When I started my preparation, after I did a hernia surgery, I couldn't do everything in training, so my father (Yoshizo) told me to train three or four types of kicks and use them in sparring, but very carefully, because they hurt a lot, it's like the elbow. When I came to Canada I met Steven Seagal, and he told me 'Lyoto, this kick will hit.' But I wasn't worried to use it or not, I'd do it if the opportunity came. I came more relaxed to the second round and hit that. It's not like it came from nowhere. ... Everybody at the stadium called me ‘Karate Kid' after that (laughs)." I think we can be sure this was not the original intent of the kick though. As Ciorbaremus and Noah have said, this is a sparring / fighting / duelling use of the kick at a distance against another skilled martial artist. It’s not a good fit for the close-range chaotic world of criminal violence. You are unlikely to have the room, it’s too risky, the enemy does not have the training needed to make feinting work, they won’t be standing apart looking for an opening, and so on. There’s historical evidence against it too. Kushanku kata (Kanku-Dai) is said to have bene created by Tode Sakugawa; who was a teacher of Sokon Matsumura. In turn, Matsumura is often credited with being the creator of Chinto kata (Gankaku). Both of the double kicks in question therefore come to us via Matsumura; who has one of Funakoshi’s teachers and in ‘Karate-Do: My Way of Life’, Funakoshi makes it clear that Matsumura had little love for such kicks. Matsumura answered, “it was because of my reputation that I was granted the post of instructor to the head of the clan. But he was an indifferent student. He neglected the refinement of his technique, which, despite all my efforts, remained very crude. Oh, I could have lost to him easily if I chose, but that would hardly have been of any use to him, so instead I pointed out some of his weaknesses and then I dare him to attack me with all his might. He countered instantly with a double kick (nidan-geri). It was dextrous enough, I grant you, but I hardly need to tell you that only a rank novice would open with a double kick when facing an opponent he knew to be vastly more competent. If we take Funakoshi’s tale to be accurate, we can see that Matsumura regarded Nidan-geri to be the method of a “rank novice” and a “serious mistake”. It therefore makes zero sense that the kata he transmitted and created would have the method in them. The only logical conclusion is that the jumping version is modern tweak – probably for the alethic challenge, just as many other kicks are now done higher – and not the original motion. This is one more reason why the rapid double kick to the shins is my preferred interpretation; although Noah’s approach of using them are options also makes sense to me. Don't get me wrong, I do agree that as a whole the kick to a shin/knee or even stomach area will be a lot more effective and plasuible in both training and execution than a double head kick. But sometimes head kicks do work, I guess it depends on how depsarate you are and how you train. We recently started adding the shin mae-geri to our drills and it is opening up a lot more applications / uses than trying to land a nidan-geri, most people struggle to get up into the air anyway. Don't get me wrong, I do agree that as a whole the kick to a shin/knee or even stomach area will be a lot more effective and plausible in both training and execution than a double head kick. But sometimes head kicks do work, I guess it depends on how desperate you are and how you train. AND the nature of the conflict. Head height kicks work well all the time in mutual exchanges between fighters with complementary skill sets seeking a shared objective i.e. karate tournaments, kickboxing, MMA, competitive Taekwondo competitions, etc. I use them in “fighting sparring” all the time. However, the nature of self-defence is entirely different: it is closer, faster, more frantic and the objectives are not the same. In that environment, taking a foot off the floor and trying to kick head height is needlessly risky in an environment were so much is at stake. It is also very unlikely one will have the room to do such a manoeuvre too. It is well established that the karate kata are self-defence focused; as opposed to fighting focussed (Itosu, Motobu, et al). We can therefore say with confidence that jumping head kicks, feints, and methods that rely on an extended distance – all things we associate with a fight – are not things that should be associated with the kata. The original question in the thread was about the traditional use of the kicks as found within the kata. So, while jumping kicks can work well in martial duels, that would not be relevant to the original question. I therefore agree that jumping head kicks can work well in mutual exchanges, but I would remain firm in the view that this has no bearing on the application of the motions being discussed in this thread. I'm on the same page as Iain and Noah. My application on Chinto/Gankaku is basically the same as Iain's starting with the wrist lock and using low kicks to the shins/knees, only with a different follow up. Usually I would say that a jump in kata has meaning. It is like another stance. A stance signifies the manipulation of the mutual center of gravity. Zenkutsu dachi pushes forward, kokutsu dachi pulls inward, kiba dachi lowers it, and a jump would be the opposite of a kiba dachi: You try to "lift" the mutual center of gravity to imbalance your opponent, e.g. to set up or apply a throw. So when you try that without a partner but straighten your legs with the same force, you will jump. That is usually how I understand jumps in kata. 1) Maybe the jump orginally was right before the kicks (in conjunction with the crossed hands in front of your chest, as in both katas). 2) Maybe the jump orginally was right after the kicks (in conjunction with the following technique). 3) Maybe originally there was a jump at that point but no kicking. If you'd just jump and pull your knees up close to your body the jumping movement would look very similar. Of course this is just conjecture. I have no evidence of any kind to back up any of it. I can see that … but how did Chinto meet those 15th century Italians? :-) I’m kidding! Are you seeing the kicks as two stomps to a downed enemy there Noah? Lol, time traveling ships? The TARDIS? I see them as both potential kicks and potential stomps. 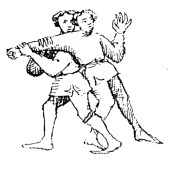 After having thrown the opponent, if they are trying to get back up, you could kick them to try to knock them back down, or simply cause damage--especially if you are still holding onto their arm after the throw. The stomp, of course, is implied in the kicking foot coming back down to the ground, and could be potentially used as an immobilization technique, or a finishing technique, or just a technique to cause damage to allow you more time to get away. Thanks for the clarification. Makes sence to me! Thank you all for your insights into these Kata applications. Very interesting and useful.